Summerville’s railroad engine turntable is a landmark that will hopefully grace Dowdy Park for a century or more to come. The result of considerable vision, perseverance and patience, the turntable represents what people can accomplish not only with determination, but also with the help of the Lord for answers to prayer when the obstacles seemed insurmountable. Originally conceived and developed in 1998 and 1999 by volunteers at Chattanooga’s Tennessee Valley Railroad Museum, it was not until May, 2002 that support structure construction began. The winning bid by Simpson Construction of Cleveland, Tennessee was considered to be virtually miraculous because their bid of $300,000 was one half of the bids from the next two lowest bidders and one third of the highest bid. The project could not have been accomplished without Simpson’s low bid, yet it would be difficult to imagine a more competent and agreeable construction partner. Throughout the project, technical support from the Tennessee Valley Railroad Museum was invaluable. City officials preferred the Dowdy Park site from the beginning because of the proximity to the downtown area and the hoped-for boost to Summerville’s economic development. However site problems were quickly discovered. An energized fiber optic line buried next to the main line railroad track and a buried high pressure natural gas line next to University Street required the plans to be altered. Then it was discovered that the underlying bedrock was so steeply pinnacled that conventional steel pile driving could not accomplish adequate pile seating in the rock. This seemed at the time to be a problem that could never be overcome at reasonable cost, but a solution was discovered: special steel pile tips for steep rock and a more controlled pile driving technique. 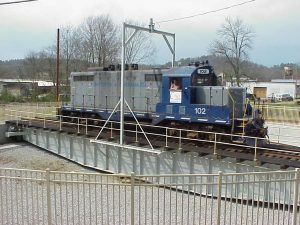 Construction was completed in the early months of 2003 at a total project cost of $688,000 including the turntable and its support structure, rehabilitation of the unloading track next to the depot, construction of the approach track, engineering, testing, project management, walkways, lighting, landscaping, and other features. With its completion it became the first turntable constructed in the Southeastern United States in many decades. Summerville City officials always believed in and supported the project. They were steadfast in their belief of its great benefit to the City. It is our hope that posterity will prove them correct.